Update, 12:30 p.m. Monday: Cal Fire officials have lifted all mandatory evacuation orders for the Snell Fire, a blaze that threatened 180 homes in Napa County after it ignited on Saturday afternoon. Officials said Monday that residents of the rural area can return but should remain vigilant. By Monday morning, the blaze had burned 2,490 acres and was 30 percent contained. The cause of the wildfire remains under investigation. Update, 2:38 p.m. Sunday: On Sunday the Snell Fire grew to 2,400 acres and was 15 percent contained. The Napa County Office of Emergency Services has opened an emergency shelter for evacuees at the Napa County Fairgrounds in Calistoga. Original post: Hundreds of people were forced to flee from their homes on Saturday after a growing wildfire broke out near the shore of Lake Berryessa in Napa County. 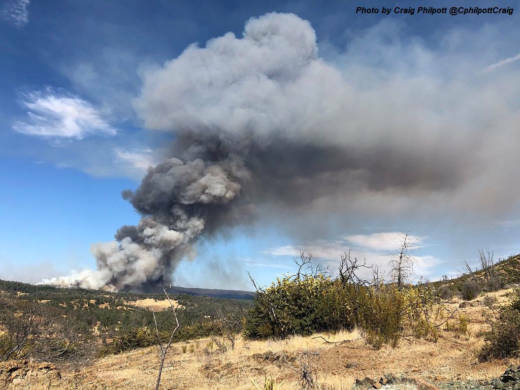 Fueled by hot and dry conditions, the Snell Fire grew by 200 acres overnight to 1,900 acres — or nearly 3 square miles. As of Sunday morning the fire was 10 percent contained. The blaze, which ignited around 2:30 p.m. Saturday, is burning in a largely rural area that's tough for fire crews to access. "There's a lot of difficult access due to the location of the fire," said Cal Fire spokesman Will Powers. "There's a lot of hilly terrain, a lot of valleys and hilltops out there." Because of those difficult conditions, Powers said crews are getting support from air tankers. After the blaze broke out Saturday afternoon, officials from the Napa County Sheriff's Office ordered mandatory evacuations for Berryessa Estates, Snell Valley, the west side of Berryessa Road from Pope Creek Bridge to the Lake-Napa County line and Snell Valley Road. Powers said roughly 200 residents are affected by the evacuation orders, which remain in effect. The hot weather and low humidity that fueled the blaze on Saturday are expected to continue Sunday and into the week, with temperatures likely reaching into the low 90s. "Crews today again will be facing hot and dry conditions out there," Powers said. There are 480 firefighting personnel battling the blaze with 56 engines, nine water tenders, three helicopters, 17 bulldozers and 10 air tankers. No homes have been destroyed, but 180 structures are threatened. The cause of the fire is under investigation.